. : SIM - ISLAND Data System :. The Result of having an Island data system. Incomplete and Inaccurate Information Leading to wastage of Money and Time. S.I.M. is specially designed to maintain the integrity and "flow" of your business - for the way business really works, information flows in between you and your employee's customers and vendors. It is one system to manage your entire institutional setup from end-to-end. 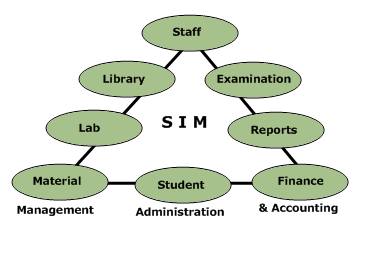 Whether you are running a small school or a big professional education institute, SIM can improve your productivity dramatically. With SIM package, you get comprehensive e-commerce at a fraction of the price. With Complete Network Compatibility SIM is available with both LAN & WAN versions.